Is water becoming an electoral tool in South Africa? Most of South Africa is in the midst of a hopeless drought. The effects of the drought are going to be felt more severely than any before us. We have no more dams to build in any more rivers and any thought of raising the wall level of Voëlvlei (Cape Town’s second biggest supply dam) is laughable as the dam seldom fills, and this year did not get above 50% of capacity. Dam levels are dire. Drought is predicted for the next season into 2016. Energy supply will prevent any meaningful supply from desalination schemes. It takes 7 kilowatt hours to produce one kilolitre of potable water. Yet our authorities are reticent to utter a word about water conservation, and one would be justified to ask – Why? The all-embracing meaning of conservation of water means not only to use less water, but also harvesting water from roofs for domestic use making this source primary and only augmented by a municipality . We thereby get to use 90% less water supplied. The concomitant reduction of sewerage effluent is also 90% providing capacity for sewerage treatment works. Municipalities have few ways of income. Those ways are rates, solid waste, electricity, water – on the same meter – sewerage. Another controversial one is traffic fines. Ways must be found to use less water. Never in the history of politics has there been any word – must – that has been more studiously ignored. Cape Town authorities have done so in favour of an election next year, and any water restrictions are politically unpopular, but the backlash from an electorate forced to pay extra for less water and sewerage would be akin to the university protests. The drought should have been anticipated and restrictions imposed when we had plentiful water stored. It could already be too late; still nothing is said or done! Droughts typically come around every seven years. Could it have been the fact that eleven years have prevailed since the last drought and this made our authorities assume that we would in perpetuity receive higher than average rainfall? 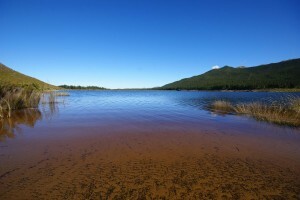 If there are no water restrictions in Cape Town until after April next year, the dam levels – presently 72% – will on average be lower than 20% of capacity. The winter of 2014 saw the dams overflowing, and the dams got drawn lower than 50% by the end of summer 2015! The draw is frightening as our biggest dam by far – Theewaterskloof cannot be drawn down further than 30%, and the second biggest dam Voëlvlei is lower than 50%. Furthermore Voëlvlei suffers eutrophication later in the summer season and the water must be used soon as when it gets lower it will be useless and possibly toxic. This means that the smaller dams will be emptied completely leaving outages as cold comfort to balance supply. A lesson for us is Ballito Bay in KZN along with other areas along that coast that receive water for only a few hours each day. Cape Town will be worse off yet if we do not start saving water now, rather than after the 2016 municipal elections. What is missing is any ability to reason that water should not be regarded as a proverbial political football to be kicked around by our politicians, and used as an electoral tool to our disadvantage.